I’m probably in the minority in that I actually find Kevin Hart more funny than annoying, as well as not tiring of Ice Cube’s angry man shtick yet, but this was a pretty dismal comedy effort from the pairing that surprisingly did great business in the US. Becoming a trend with comedy films these days is that the best bits are all in the trailers, and unfortunately that’s the case here, although there are still a good few laughs throughout that stopped this being unwatchable. 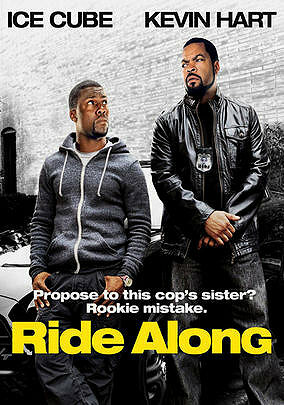 The premise of the film is that Ice Cube’s cop character is going to take his sister’s boyfriend (Hart) on a ‘Ride Along’ to prove he’s a worthy enough man to take her hand in marriage, and this is played out against Ice Cube’s attempts to track down an elusive criminal. It’s fairly standard buddy cop stuff in terms of the plot and there isn’t really anything you haven’t seen before, so your enjoyment of this is likely to depend on your tolerance for ‘comedy’ films in general. There isn’t a great deal else to say about this one to be honest!